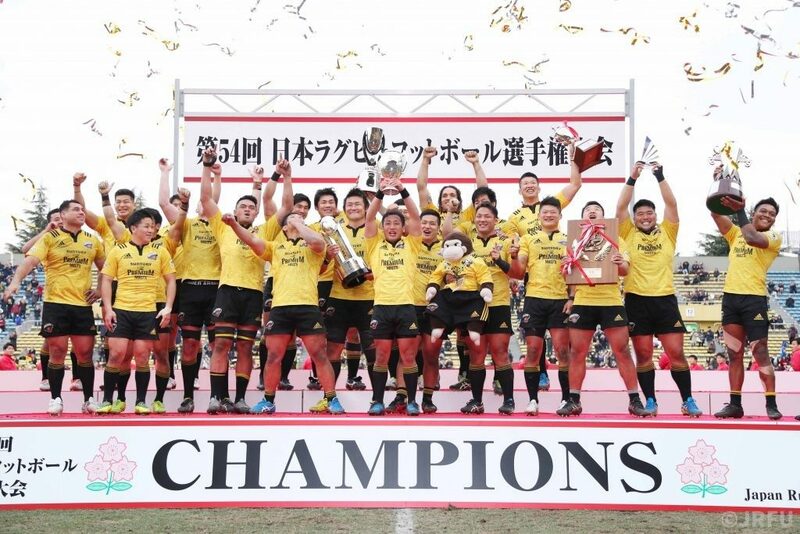 TOKYO (Jan. 29) – Suntory Sungoliath defeated Panasonic Wild Knights 15-10 in the final of the 54th All-Japan Championship on Sunday to complete the league and cup double. Two weeks after they won the Japan Rugby Top League, Keisuke Sawaki’s side won their 17th straight game this season to win the season-ending tournament for the seventh time. “All season we have trained how to cope with unexpected situations and we showed that today,” said Sawaki. The game, played in front of a full house of 20,196 at Prince Chichibu Memorial Rugby Ground, was a pulsating affair in which both defences rose to the occasion. There may have been just one try scored but the rugby played was of the highest order. The first half saw no quarter given and the sides turned around level at 3-3 following penalties by Kosei Ono and Takuya Yamasawa. Ono kicked two further penalties in the opening 15 minutes of the second half as Suntory went 9-3 up. But Panasonic hit back with Daniel Heenan crossing for the only try of the game after he had charged down a kick. Yamasawa added the conversion to give the Wild Knights the lead. But it didn’t last long as Ono kicked two more penalties in the 60th and 65th minutes. Suntory’s defense then held firm the rest of the way. “Together with Panasonic we played a game of rugby to be proud of,” Suntory captain Yutaka Nagare said.